More than 100 diners will play their part in a drama charting the rise and possible fall of character Cyrus Irani at restaurant chains’ newest establishment. . . IT IS 1949 and the winds of change are blowing through Bombay. Cyrus Irani is trying to go straight after a spell in the infamous Arthur Road jail. He has some money and the Iranian heritage wheeler-dealer (whose family like many others of a similar background have been in Bombay for years) has invested in a jazz club/restaurant called the Roxy. Cyrus and his girlfriend Ursula make for an interesting pair and there’s a heady atmosphere as the band tune up to entertain you with some authentic Bombay jazz…but then the local police inspector who knows Cyrus checks in and starts to ask a few questions. 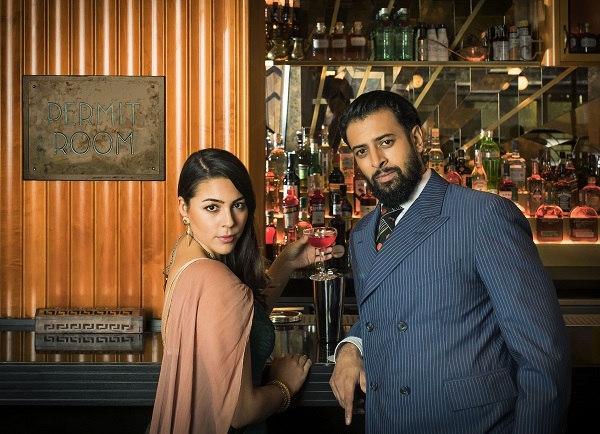 It’s all intriguing enough to be a play on its own – but it is actually an immersive piece of theatre that takes place at Dishoom’s new restaurant in Kensington, West London. A very popular and much admired small chain of Indian eateries in the UK (four in London; one in Scotland) based on the ideals and décor of the once ubiquitous Irani cafés in Bombay (Mumbai), Dishoom continues to blaze its own trail and combine acute entrepreneurial acumen with a strongly creative streak – seemingly unmatched. “Every Dishoom has a story behind it. This is the story of Cyrus Irani and his club/restaurant – instead of just inviting you into the physical space (the new restaurant in Kensington), we thought, why don’t we literally invite you into the middle of a story. “Instead of just coming to dinner at the new Dishoom – which would be lovely in itself – why wouldn’t you come to the first two or three weeks and the opening night of the Bombay Roxy and see what happens to Cyrus Irani,” Thakrar continued. The drama is – how will Cyrus manage expectations on the opening evening – can he get through the night without incident? “He is trying to get the night off without a hitch, but then all these problems arise – his lover and the singer from the band seem to have something going on and the chief of police who has a vendetta against him turns up and then there’s another mysterious stranger who turns up after an escape from Arthur Road jail,” explained Jones. All in all, Cyrus’ attempts to go straight are going to be severely tested. “He is trying to become a good man but has a chequered past. He was imprisoned – but without giving too much away – he was innocent in the situation (for which he was jailed),” explained Jones. Thakrar sees the theatre experience as a natural extension of what Dishoom does. “It’s really quite natural for us to do storytelling. We are doing it for its own sake and because we love it,” said Thakrar. It started as nothing more than an idea bandied about by Thakrar and his wife but it gathered momentum and he mentioned it to friend Eduard Lewis, who works with Swamp and is now director of the ‘Night at the Bombay Roxy’. Thakrar stated: “I got excited about it because a friend Naresh Fernandes has written a book called ‘Taj Mahal Foxtrot’ which is about the Bombay jazz scene – I am a bit of a jazz nerd. A five-piece jazz band will play live on the evening from a band area upstairs, while diners enjoy a menu that is consistent with the period. It promises to be quite the opening – and both Thakrar and Jones would be impressed if diners turn up in period attire – it isn’t necessary but would add to the atmosphere. 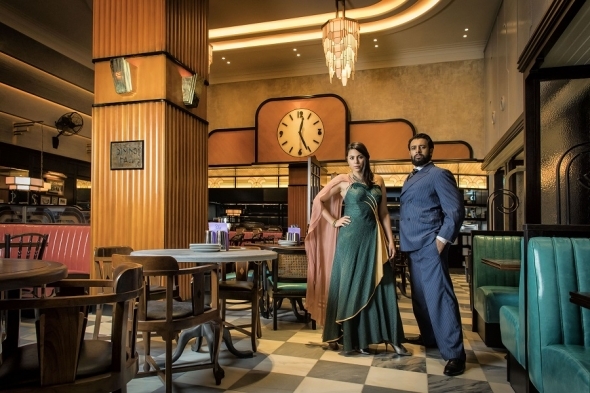 There are photographs of famous jazz figures visiting Bombay adorning the walls of the Kensington restaurant, which is based on the art deco architecture to be found at the real Liberty Cinema in South Mumbai. The new Dishoom opened for a week (November 16-23) as part of a soft launch. For Thakrar who now runs the chain with another cousin Kavi Thakrar, (in the beginning there were two other investors), it is an extension of what they did a couple of years ago releasing an LP vinyl record, ‘Slip-Disc’ with tracks from Western bands inspired by India in the 1960s and 1970s and some Indians going the other way to make western rock and roll. Thakrar, an ex-management consultant, said right from the outset he wanted to highlight a different form of cultural exchange between the UK and India. His family have strong links with Mumbai (as it is called now) – his grandmother had a flat there and the old Irani cafés of which there were many at one time (before declining massively) inspired him to create Dishoom and remains an integral part of the restaurant’s branding. “It was a rich but thin seam of heritage. The Irani cafes were very shared spaces, everyone was welcome and in the 1920s and 1930s that was pretty rare. You would have Muslims, Hindus and Parsis, sitting together. It really did break down barriers in society – that was at the core of the idea and it was a very appealing one. “In fact, just recently my Dad revealed that my first birthday was celebrated in an Irani café. My Dad just told just me that – I started a whole business based on this, and I didn’t know,” said Shamil Thakrar. Akshay Kumar, Bollywood superstar, on ‘Gold’ : It’s one of the most beautiful films I’ve done’ Watch – subscribe!